Good afternoon, space fans! It was a (relatively) quiet week on the International Space Station, but that's just because some serious scientific strides are about to take place! the "One Year Crew", prepare to leave Earth for an extended space stay. On Wednesday, in preparation for this Friday's arrival of three very important new crewmembers, the current ISS crew raised the orbit of the space station by firing the engines of the docked ISS Progress 58 spacecraft for 4 minutes and 18 seconds. This new, higher orbit will facilitate the docking of Expedition 44's Soyuz TMA-16M spacecraft, which will bear the "One Year Crew" of NASA astronaut Scott Kelly and cosmonauts Mikhail Kornienko and Gennady Padalka to the ISS. The One Year Crew will be on the front lines (well, front orbit) of an unprecedented scientific study to assess the extended durability of humans living in space. Biological, psychological, and other important aspects of the astronauts' lives will be scrupulously studied as Kelly and Kornienko spend a full year aboard the ISS. Padalka too is no spacefaring slouch - when his sojourn as station commander is complete, he will hold the record for most cumulative time spent in space by a human. Most intriguingly, Kelly's mission on the ISS will be mirrored on Earth thanks to his twin brother Mark, who is also an astronaut and former resident of the ISS. The brothers spoke with ABC News about the research, repercussions, and road to future long-duration manned missions that will stem from their unique and extraordinary experience. Mark (with mustache) gets "the easy part", while Scott gets "the fun part." "We have always in the life sciences assumed that the next increment of duration is where the cliff is, where the brick wall is that we're going to run into, and so far we've really not seen it. So far, the human body has proved remarkably adaptable to the most novel environmental situation that is possible to conceive of, and that is the absence of gravity. Gravity has influenced everything on the earth in terms of biology from the very beginning of biological time, and now we're finding that those resources that the body has to take care of itself in different attitudes, different postures, different environments on the ground, are also pretty good for living in the absence of gravity, as long as you maintain pressure, and temperature, and food, and things like that. So we are not yet encountering the cliff...there's no 'Here Be Dragons' on the map." Over 270 experiments will be carried out over the duration of Expeditions 43-44. One interesting focus of research will be how prolonged exposure to micro-gravity affects astronauts' eyes and vision, which has been shown to occasionally and temporarily deteriorate, possibly due to differences in pressure and blood flow to the head in space. A video from NASA regarding this research explains more! 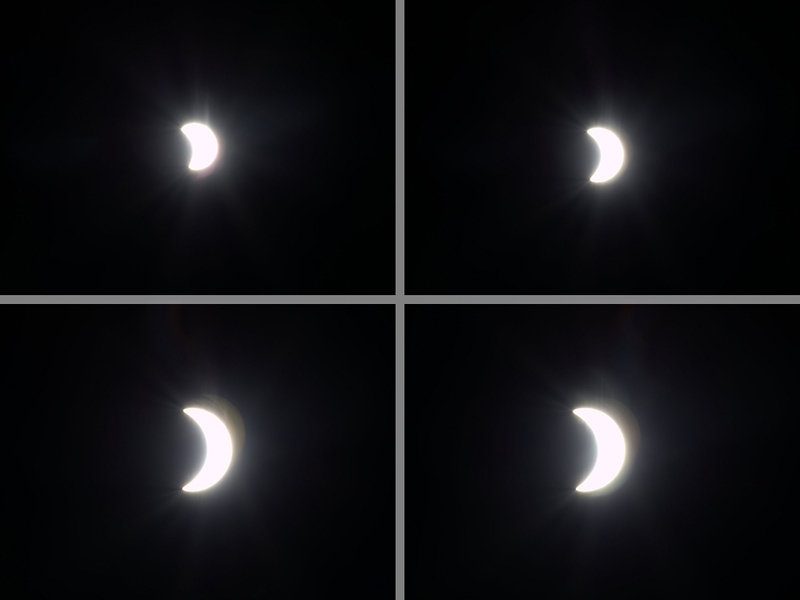 This isn't a simulation of space-induced vision decline...it's imagery from last week's solar eclipse! In other news, a solar eclipse was captured from a window on the ISS by ESA astronaut Samantha Cristoforetti. The eclipse occurred Friday morning and will be followed by a lunar eclipse on April 4th. Cristoforetti also kept busy this week by working on the TripleLux-B experiment, which assesses the effects spaceflight and space-based radiation have on immune systems at the cellular level. "When I think about life, you can see cities, you can't see people but you know there is so much going on down there - people hurting, playing, etc. - you can see lights and you know that means there are people. I am curious and always wondering... what are they doing? How are they doing? Even in the middle of the Sahara desert I would see lights and wonder what those people are doing." Thanks for shining a light on scientific discoveries that will benefit all of those Earthlings, Butch. For those who want to watch some serious space spectacularity unfold in real-time, you can tune in to NASA TV on Friday for all the pre-launch, launch, and docking coverage of the One Year Crew's historic mission. Safe spaceflight, gentlemen! We'll be eagerly awaiting to hear what discoveries and daily intrigues occur during your expedition. Watch this space! 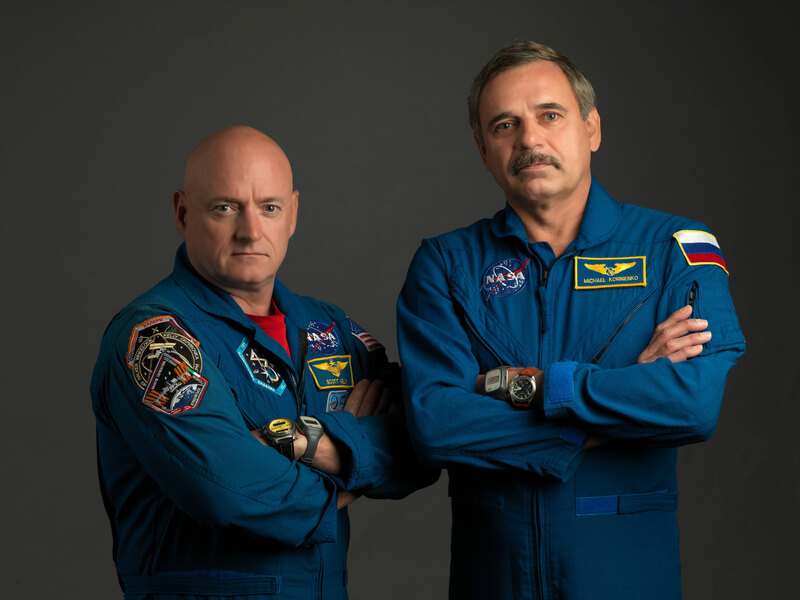 Game faces for space: Kelly and Kornienko are good to go!